Stephanie McNamara, our Director of Operations just returned from a month-long journey to Laos, Cambodia, and Bali. Hilary, a past retreat participant and collaborator with International Yoga sat down with Stephanie to interview her about her journey. Read below for the recap of Stephanie's adventures to these inspiring destinations on the other side of the world. Hilary: What inspired your trip to Southeast Asia? Stephanie: This trip was planned as a part of our expansion and new trip development to Laos and Cambodia. During my time there I met with our hand-selected accommodations, our awesome ground and guides teams, including About Asia -- our partners who are doing some extremely important work for the educational systems in the region. The philanthropic arm of IY and giving back to the places we are exploring is at the heart of our mission statement and we are so pleased to be working with individuals who are making a real impact on an ongoing basis between our visits. Below you'll see me enjoying a dinner at a truly local spot, with a great group of our Cambodian team. This actually turned out to be a surprise birthday party, which was just as much a surprise for me as well! Anthony Bourdain would have been proud, our meal was quite eclectic. Hilary: Was this your first time visiting Laos, Cambodia, or Bali? Stephanie: No, the first time that I decided to travel alone, I was 21 and I had just graduated from getting my business degree at university. I spent 3 months saving up every last penny I could before packing a backpack and flying to Indonesia on my 22nd birthday. In the following months, I made my way from Bali to Lombok, Nusa Lombogan, then to Singapore, through Malaysia, crossed the border into Thailand by bus, traveling the entire country of Thailand by boat, car, bus, and train. When I reached the top of Thailand, I crossed the river to at the border into Laos and traveled to the riverside city of Luang Prabang-- where I swiftly fell in love with what is now our newest South East Asian destination. Following LP I then went to Vientiane the capital, before making my way to Vietnam and finally back to Thailand. Following that long journey that established Asia as my home away from home, I made my way back in again in 2014. I didn't know it at the time but this return to Asia would change the entire trajectory of my career. After almost 3 months one of our (and my) teachers Erika Trice contacted me and asked me to assist her on International Yoga's annual Balinese New Year program in Ubud -- a premiere itinerary that absolutely everyone should experience at some point in their lives. Needless to say, the rest is essentially history because I returned home and was promptly offered the job I have today from my boss and mentor, Michelle Fliegauf. I am so lucky, I often can't believe it fell all in place just like that in a place I love so dearly. Despite visiting Asia twice before, this summer's trip was actually my first time visiting Cambodia. I had skipped Cambodia on previous trips because I knew that there was a strong enough draw for me to make my way to Angkor Wat, one of the largest and oldest religious complexes in the world and this was my perfect opportunity! Hilary: What are unique aspects of the cultures in these countries? Stephanie: The most unique part about traveling in Asia - especially as a female - is my innate sense of always feeling at ease and at home. It is quite simply, the reason I keep returning. Every time, a deeper level of the region reveals itself. The people are so warm, kind, honest, and helpful, not to mention the food and of course, the scenery. What really captured me during my first visit in 2010, was the seamless fusion of the French colonial history with the deep spiritual Buddhist community. This combination makes for a fascinating, almost romantic juxtaposition which strikes such a unique balance. In Luang Prabang specifically, it is reflected in the food and architecture in a way that coexists beautifully with the traditional roots of the region while also being starkly different than its neighboring countries of Thailand and Cambodia. Relaxing days watching the boats float by on the river, drinking ice coffee and, the smell of freshly baked pastries wafting through the air. Hilary: What is the climate like? Stephanie: Largely the region I have traveled is temperate year round and tropical. Our retreats are always run during what is considered during shoulder seasons for ideal weather conditions as well as to avoid the crowds! Hilary: What is special about the retreat center accommodations you chose? 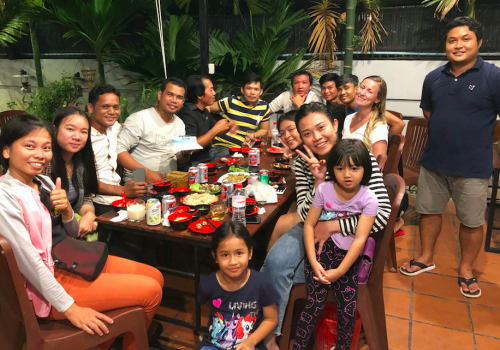 Stephanie: I have been very fortunate to have found some of the most distinctive and exceptional locations/accommodations to host our programs both in Laos, Cambodia, and Bali. 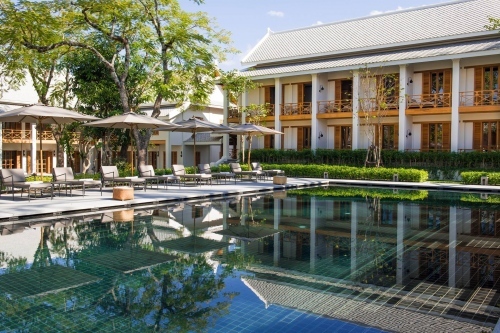 Whether you’re tucked into the rice fields in Indonesia or perfectly situated a block away from the night market in Luang Prabang, each one of our properties is reflective of the local culture and is specifically chosen for its ideal accessibility to the noteworthy sites of each region. I am excited to send our upcoming groups to these truly special destinations. Hilary: What is the biggest challenge you found while traveling in Southeast Asia? Stephanie: Having to come home, honestly! South East Asia is such a special place for me and while California and the Bay Area will always be my first home, you could drop me down in nearly any part of SEAsia and I'd be just as happy. Hilary: What will be unique about International Yoga’s upcoming trips to Southeast Asia? Stephanie: We’ve partnered with some of the absolute best guides and teams in Asia who have handcrafted our specialized itineraries to make each one an experience of a lifetime. Be it receiving a water blessing from a monk or crossing a reservoir at sunset for a fine dining experience in a local village, these trips will leave an impression on both your mind and your heart. 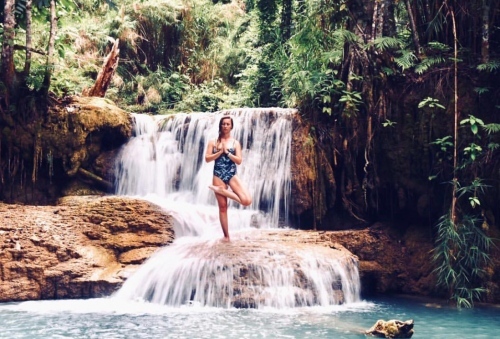 Hilary: What else would you recommend yogis must do while in Laos, Cambodia, or Bali? What are your favorites? Stephanie: Eat! The food in Asia second to none. I have a laundry list of must-dine locations I am happy to share with any of our interested travelers and while it's always good to eat at reputable locations, getting out of your comfort zone and trying something new is something I would strongly recommend! In the words of the late and great Anthony Bourdain, "If I'm an advocate for anything, it's to move. As far as you can, as much as you can. Across the ocean, or simply across the river. Walk in someone else's shoes or at least eat their food. It's a plus for everybody." And as always "When dealing with complex transportation issues, the best thing to do is pull up with a cold beer and let somebody else figure it out." ~AB I promise, we will always do that for you! Hilary: Of course - Why do you love to explore and travel the world? Stephanie: I love to travel because it makes me feel connected to something bigger. It incites a certain level of introspection that can be difficult to come by in daily life in the western world. Most importantly, meeting people, hearing their stories, and learning about their lives gives my life newfound meaning each and every time. We can't wait for the participants in our upcoming programs to experience the amazing yoga, culture, and wellness offerings in Southeast Asia. View our upcoming retreats here and contact Stephanie with any questions about her trip or upcoming programs at info@internationalyoga.com.